I learned a harsh lesson about portfolio turnover during a recession. I was forced to pay capital gains taxes on distributions of a long-term mutual fund holding, even though I didn't sell any fund shares and even though the fund value had dropped more than 20% that year. Portfolio turnover is the frequency of changes in an investment portfolio. Generally, it is expressed as a percentage and measured by taking the value of securities purchased (or sold, whichever is lower) in the past 12 months and dividing by the total asset value. Low portfolio turnover means that there were few changes to a portfolio and high turnover means that there were many changes. 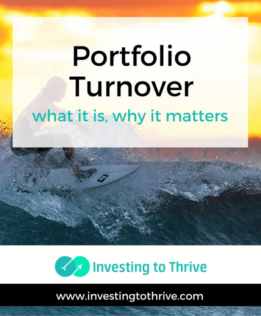 Portfolio turnover applies to mutual funds (as mentioned in my example) but also applies to managed portfolios and investment services as well as my own investment portfolio. Actively managed funds tend to have higher portfolio turnover than passively managed (index) funds. Generally, securities for actively managed funds are chosen to fit within a fund's investment strategy and deliver out-sized returns. When a stock falls out of favor or becomes too overvalued, a fund manager likely replaces the stock with a more promising one, resulting in portfolio turnover. Index funds simply match a certain index or broad definition (such as all U.S. stocks) so new securities are added only when the index is updated. However, some indexes are updated more often than others, leading to higher-than-usual portfolio turnover for an index fund. You can see then that index funds tend to have lower turnover while actively managed funds are likely to have much higher turnover. Choosing and updating securities for a mutual fund holds the potential to deliver out-sized returns. However, the portfolio turnover associated with this process can raise investor costs in a couple of ways: 1) trading fees are generally higher because more transactions take place, affecting investment returns and 2) realized capital gains are passed through to fund shareholders, triggering tax liability for investors in taxable accounts, reducing after-tax returns. Portfolios managed by outside advisors, including robo-advisors like Betterment and FutureAdvisor, also experience turnover when underlying securities are bought and sold for rebalancing and tax loss harvesting purposes. Model portfolios could also be updated for various reasons that include an investor's change in risk tolerance (resulting in a new asset allocation) or an advisor's change in its investment approach (such as Betterment's tweaking of its portfolio optimization). Transactions occur frequently as portfolios are rebalanced as often as daily and tax loss harvesting occurs throughout the year. Fortunately, robo-advisory portfolios tend to hold commission-free ETFs, largely avoiding trading costs. Tax loss harvesting involves selling securities at a loss in order to counteract capital gains that may occur due to rebalancing (or other reasons). So, there may be limited tax consequences associated with managed portfolio turnover, particularly if you opt for tax loss harvesting services. Still, investors should be aware that portfolio turnover happens inside of managed portfolios and there may be costs associated with this turnover. Your own investment portfolio experiences turnover when you buy and sell securities. You may have valid reasons for trading frequently, but should be aware of the trading costs and potential tax consequences of high turnover. Typically, you'll incur trading costs of $4.95 to $9.99 on individual stocks and non-commission-free ETFs, and as much as $75 on certain mutual funds depending on your brokerage firm. If you trade too frequently, you may get dinged with early redemption charges on mutual funds, including those that are categorized as no-load, no-transaction-fee funds. Depending on your tax bracket, and whether you trade frequently in tax-advantaged or taxable accounts, sales of securities may generate capital gains taxes. Minimizing your portfolio's turnover can help you avoid unnecessary taxes and allow you to build wealth more effectively. Notably, though, certain types of selling can benefit you. For example, selling stocks for a capital loss and reinvesting in more promising securities can offset gains. Further, some investors churn their portfolios on purpose in order to raise the cost basis of their holdings as a tax-planning strategy. They plan their annual income carefully to maintain a low tax bracket, sell selected stocks to receive 0% capital gain tax treatment, and then repurchase these securities at the going rate, increasing the cost basis. Future capital gains will be calculated using this higher cost basis, minimizing gains for tax purposes. So, in some scenarios, well-planned portfolio turnover can save money. I learned the hard way about portfolio turnover and its consequences. But now that I understand the potential consequences of portfolio turnover, I can plan more carefully and take advantage of its benefits while minimizing expenses. In the article about Schwab’s robo service you mention the change in correlation between different asset classes. Do you have data I can review? You’ll find graphs in this document illustrating how certain segments (asset subcategories like U.S large company stocks and U.S. small company stocks) are becoming more correlated. The white paper referenced the 2008 recession, which reminded me of the stock market decline as well as fall in real estate value (along with high periods of unemployment. Those who had diversified among stocks and real estate (which should have been negatively correlated) generally experienced downturns in both, seemingly defeating the purpose of diversification. Great question — and something I would like to research and write more about. I have been focused on stock market investing (mainly U.S. but now increasing my international exposure) but want to improve in my knowledge of asset allocation and how it can benefit me in both the short- and long-term.